NEW! The Face in the Window, Haunting Ohio Tales, Chris Woodyard, 2013, 256 pp., notes, bibliography $16.95 NEW! 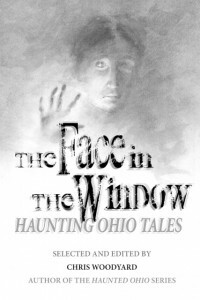 The latest book from Haunted Ohio author Chris Woodyard, The Face in the Window is a Victorian scrapbook of hauntings and horrors. It’s a time-machine that takes you back, not to some Disney-esque version of the 19th century, but to the bad old days of a very haunted Ohio. There you’ll meet the father and son who who hung themselves with the same rope and are said to haunt a Toledo Bridge; Minnie, the Fire-Spook of Springfield; and the Coshocton woman who was tormented by the spirit of her dead husband because she had promised him at his death-bed that she would not marry her lover. When she quickly broke that promise, her dead husband began to appear to her and their children. Full of long-unseen reports of spook lights, ghastly Women in Black ghosts, clothes-shredding poltergeists, the spirits of murdered children, and uncanny graveyard ghosts, this book is a treasure-trove of all-new stories, unearthed from old newspapers, county histories and 19th-century journals. Here are vampires, snake horrors, ghost photos, a banshee and other omens of death. The Face in the Window is a chilling glimpse of Ohio’s ghosts of the past. See a fact sheet with more details including the Table of Contents here.